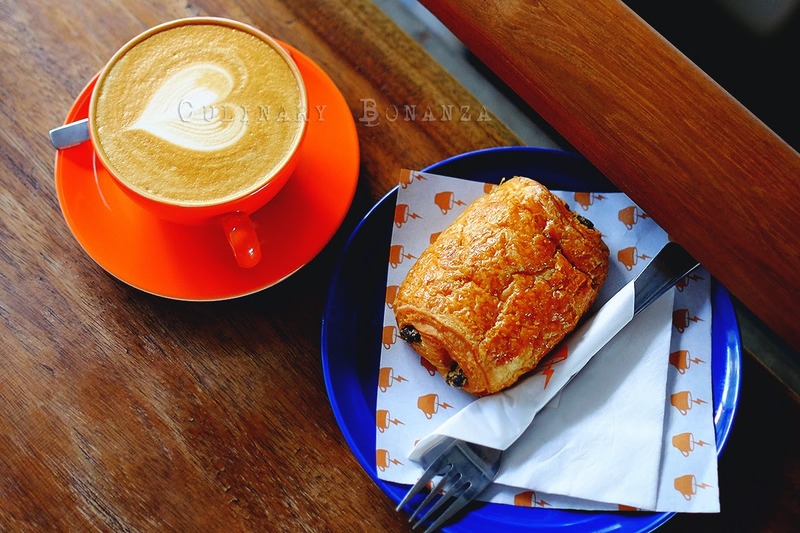 Residents of west Jakarta, put your hands up in the air, because your morning coffee fix is going to get better than that cup of joe you used to buy from 'that' franchised Cafe(s) or Kopitiam(s). West Jakarta is an eclectic foodie turf to say the least, being home to the wildly successful seafood house (Saung Grenvil) and a myriad of other local food and street food (don't forget the ramen!). 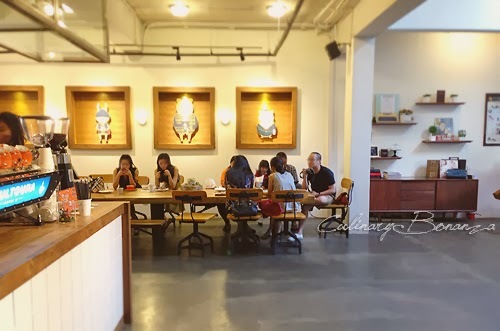 While the area is famous for being a foodie-hub swarming with awesome Asian and (somewhat substandard) Western eateries, Jakarta Barat is terribly lacking of any decent, non-franchised, not-in-a-shopping-mall, coffee place. So much unlike the South or Central Jakarta, where artisan coffee places tend to flourish. 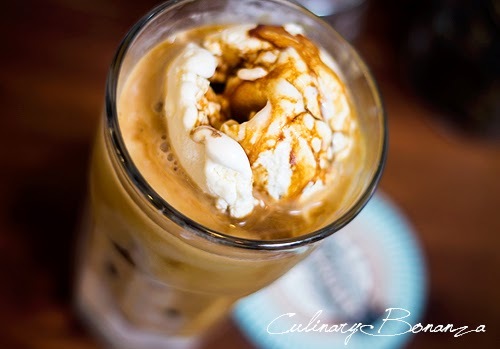 It is a no-brainer why Koultoura Coffee stands out from the rest, like the ice cream floating on top of my Fluffy Latte (photo above). - It serves absolutely proper coffee at an absolutely decent price (IDR 20,000/shot up to IDR 40,000/cup). The menu offers coffee straight from the French Press or Vietnamese Drip. From an amateur's point of view, it kinda makes me think that they know what they're doing (or at least so, it appears). - The place somehow exudes the 'commune' feel. I wish I had a better word to describe it, but commune does it, so yeah. The long polished raw log table as the centerpiece on the first level, means you might have to sit next to a stranger, sharing the same table. This makes the place feel less individualistic and more welcoming, but of course, there are private corners where you can have your private rendezvous. 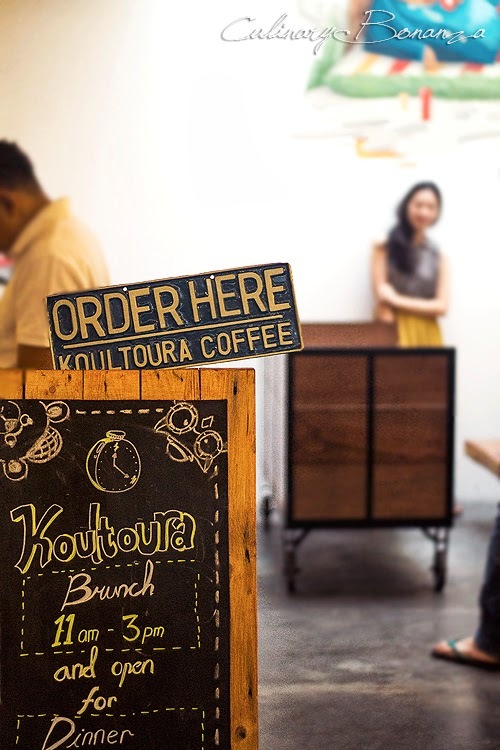 - Koultoura goes all-out with the branding. It starts from the moment you see the building's exterior to the nitty gritty details like the coaster, decor, business card, etc. There are catchy, endearing cartoons all over the place in this spacious house, painted in sober colours (black, white) and wood-furnished. I find it like a clash of culture, (purposely) confused, just like the millenial generation (my generation) who seem to like this kind of uncategorizable place. Seen in the background, a guest posing in front of the famed cartoon mural. 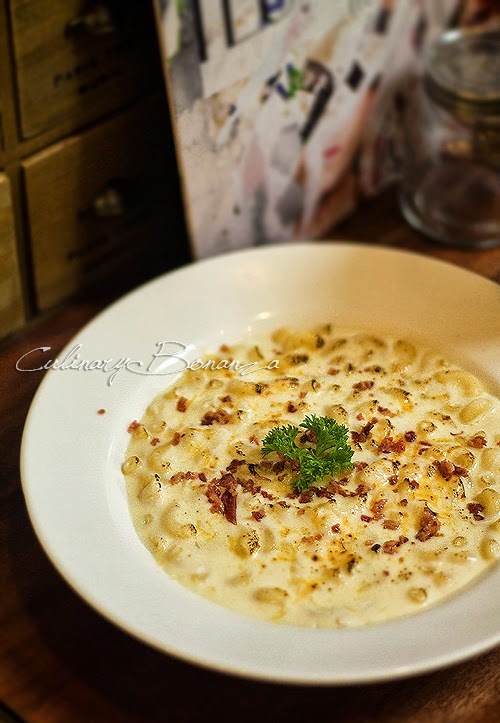 - It promotes itself as a breakfast and brunch restaurant. Who doesn't love brunch? When I came on Sunday afternoon, Koultoura's customers had already fill up the parking spaces, even taking up some space on the street. Parking may be challenge especially at busy hours, so if you hate parting too far away from your precious car, consider coming at odd hours (early morning or late night). It was such a warm afternoon, I decided to go against my usual coffee s.o.p. (standard operating procedure; which is to order the hot coffee, to better judge its true taste). Instead, I ordered something cold: Fluffy Latte, a tall glass of straight latte (no sugar) topped with silky vanilla ice cream. 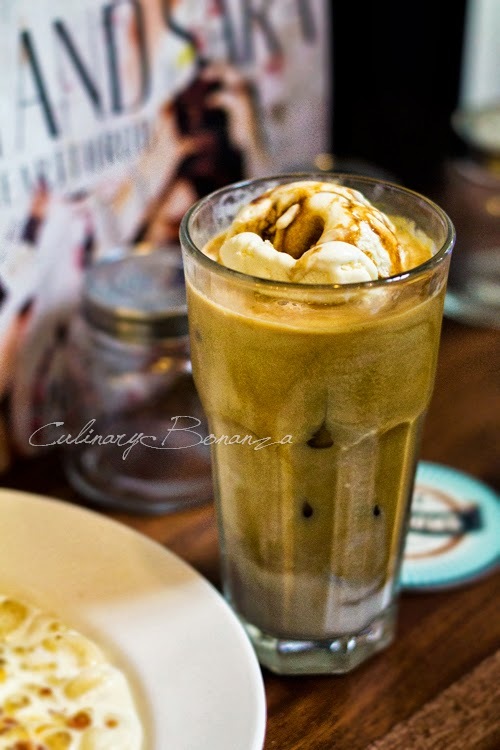 Despite the thick dollop of ice cream, I could still tell that the latte tasted well. Oh, by the way, you pick up your own coffee at the pick-up counter, even if you're a dine-in customer (hence no service charge). Indonesians are probably not used to such self-service treatment, but this is how it works out there. I didn't get to try any food items other than the Truffle Mac & Cheese, so I can't comment much yet. The Truffle Mac & Cheese was pretty alright, but it didn't quite 'hit' my taste buds, which means either hardly or no MSG was used (good thing there!). Although missing my MSG dose, I still went home happily and am still curious about the place. I shall definitely come back again to try the brunch and other coffee items, French Pressed most likely. Come here for: breakfast, brunch, coffee, check out the place and notice the visitors are somewhat the hipsters who refuse to have their coffee be called 'venti' or 'kopi C'. *) Prices are subject to 10% Tax. No Service Charge (yay! ).